CN17｜Digital Pianos｜Products｜Kawai Musical Instruments Manufacturing Co., Ltd. The CN17’s brand new Responsive Hammer Compact II (RHCII) keyboard action has been developed to represent the distinctive touch of an acoustic grand piano. Based on the highly-regarded RH keyboard action design, its spring-less technology and sturdy construction delivers consistent upward and downward motion for a smooth, natural, and highly authentic piano playing experience. The CN17 digital piano captures the beautiful sound of Kawai’s highly acclaimed concert grand piano, with all 88 keys of this exceptional instrument meticulously recorded, analysed and faithfully reproduced using advanced Harmonic Imaging technology. Recording each key individually in this way, preserves the rich harmonic character of the SK-EX concert grand piano, and guarantees that the sound heard when playing any one of the CN17’s weighted keys is a faithful representation of the original acoustic source. 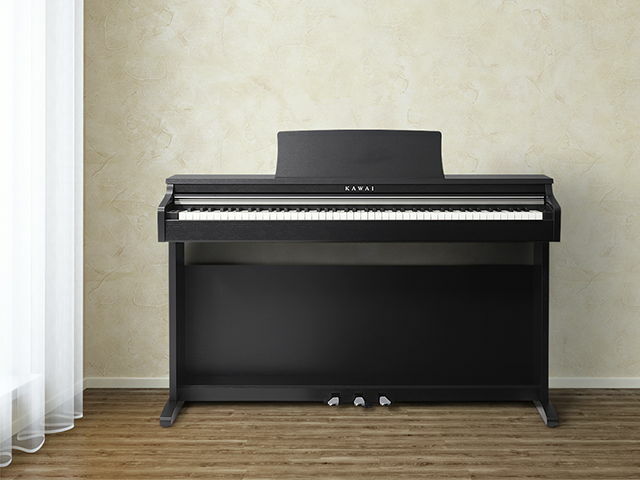 The CN17 offers a highly detailed acoustic portrait, employing Kawai’s proprietary Harmonic Imaging sound technology to ensure smooth tonal transitions across the keyboard and throughout the entire dynamic range. The CN17’s powerful digital effects engine further enhances the instrument’s core sounds, applying additional reverberation effects that simulate the acoustic environment of a recital room, live stage, or concert hall, bringing performances to life. The elegant CN17 also includes a variety of convenient digital functions to complement its authentic keyboard touch and rich grand piano sounds. A selection of different instrument voices, built-in lesson songs, and the ability to record and playback one’s performance are just some of the features accessible from the discretely placed cheek-block control panel, while Bluetooth® and USB functionality allow the instrument to be connected to other devices with ease. The CN17’s convenient lesson function allows aspiring pianists to study classical piano using a collection of Czerny, Burgmüller, and Beyer etudes, or learn time-honoured standards from the popular Alfred Basic Piano course books. Supplementing its realistic acoustic piano voices, the CN17 also offers a selection of additional instrument sounds, including electric pianos, organs, harpsichord, vibraphone, and strings. The CN17’s Spatial Headphone Sound (SHS) technology enhances the depth and realism of the instrument’s sound when listening through headphones or earphones. The player can select one of three different acoustic presets that adjust the spatial positioning of the sound, while also helping to reduce auditory fatigue when using earphones or headphones for extended periods of time. In addition, the CN17 also allows players to select a variety of headphone types (Open, Semi-open, Closed, In-Ear, Canal, etc.) for an optimised listening experience. 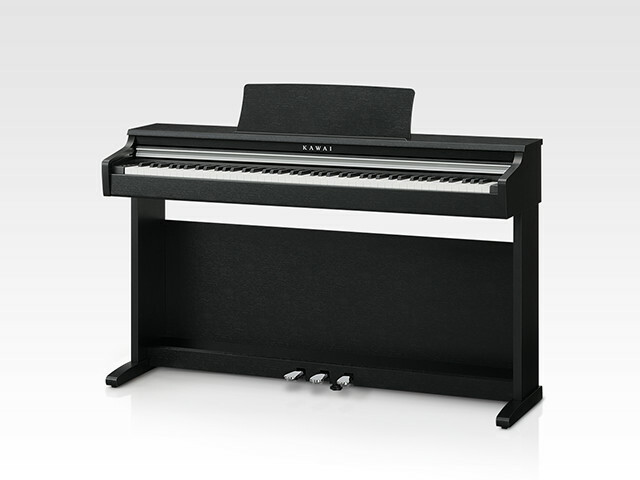 Reinforcing the CN17’s reputation as the most realistic digital pianos in its price range is Kawai’s Grand Feel Pedal System. This unique feature replicates the position and individual weighting of the damper, soft, and sostenuto pedals of a Shigeru Kawai SK-EX Concert grand piano to further enhance the CN17’s acoustic piano-like authenticity. 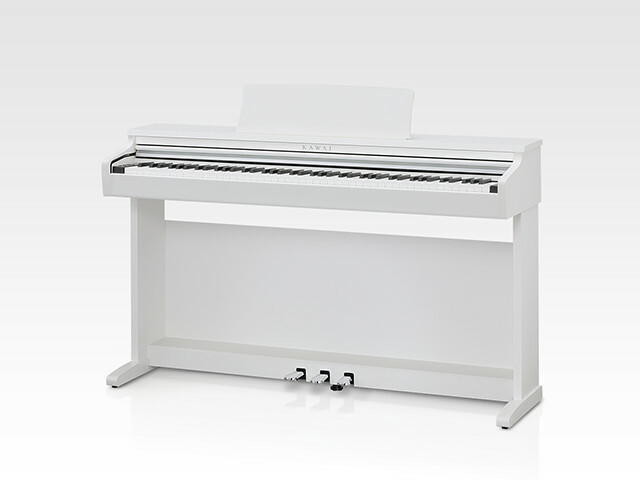 The CN17 features a USB-MIDI port and standard MIDI In/Out jacks, allowing the piano to be connected to a computer for notating compositions, or to other MIDI devices such as synthesisers and workstations. In addition to USB-MIDI and standard MIDI connectors, the CN17 also boast integrated Bluetooth MIDI technology, allowing the digital piano to communicate with supported smart devices wirelessly. Once paired with a phone, tablet, or laptop, CN17 owners can easily expand the instrument’s functionality with a wide range of education, performance, and scoring apps. A dedicated Kawai Virtual Technician control app is also freely available, providing an enjoyable way to learn about and adjust various acoustic piano characteristics from an attractive touch interface, without the need for additional adaptors or cables. The CN17 utilises energy-efficient components that reduce electricity consumption by over 60% compared to previous models. Furthermore, the instrument’s optional power saving feature can also turn off the piano automatically after a speciﬁed period of inactivity, thus preventing unnecessary energy use.